134:7.1 When Jesus returned from the journey to the Caspian Sea, he knew that his world travels were about finished. He made only one more trip outside of Palestine, and that was into Syria. After a brief visit to Capernaum, he went to Nazareth, stopping over a few days to visit. In the middle of April he left Nazareth for Tyre. 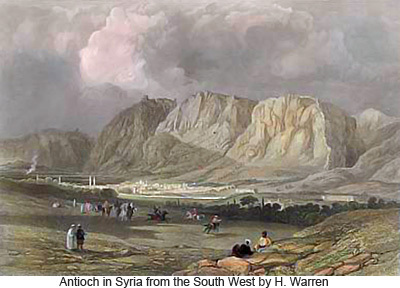 From there he journeyed on north, tarrying for a few days at Sidon, but his destination was Antioch. 134:7.2 This is the year of Jesus' solitary wanderings through Palestine and Syria. Throughout this year of travel he was known by various names in different parts of the country: the carpenter of Nazareth, the boatbuilder of Capernaum, the scribe of Damascus, and the teacher of Alexandria. 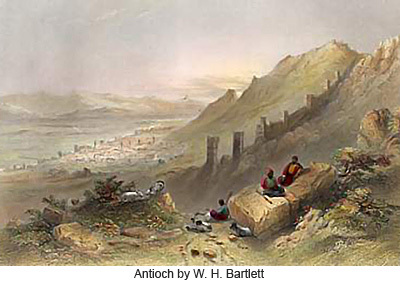 134:7.3 At Antioch the Son of Man lived for over two months, working, observing, studying, visiting, ministering, and all the while learning how man lives, how he thinks, feels, and reacts to the environment of human existence. For three weeks of this period he worked as a tentmaker. He remained longer in Antioch than at any other place he visited on this trip. Ten years later, when the Apostle Paul was preaching in Antioch and heard his followers speak of the doctrines of the Damascus scribe, he little knew that his pupils had heard the voice, and listened to the teachings, of the Master himself. 134:7.4 From Antioch Jesus journeyed south along the coast to Caesarea, where he tarried for a few weeks, continuing down the coast to Joppa. 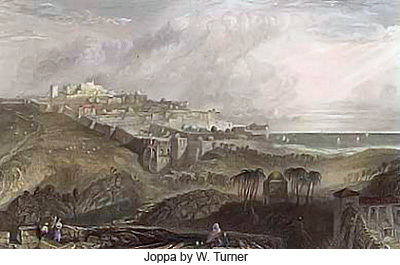 From Joppa he traveled inland to Jamnia, Ashdod, and Gaza. From Gaza he took the inland trail to Beersheba, where he remained for a week. 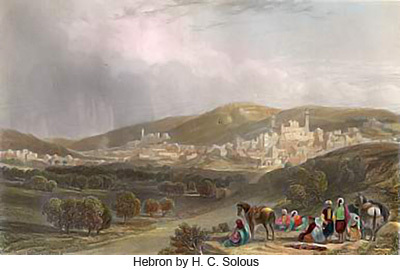 134:7.5 Jesus then started on his final tour, as a private individual, through the heart of Palestine, going from Beersheba in the south to Dan in the north. On this journey northward he stopped at Hebron, Bethlehem, (where he saw his birthplace), Jerusalem (he did not visit Bethany ), Beeroth, Lebonah, Sychar, Schechem, Samaria, Geba, En-Gannim, Endor, Madon; passing through Magdala and Capernaum, he journeyed on north; and passing east of the Waters of Merom he went by Karahta to Dan, or Caesarea Philippi.